Last Wednesday’s Darshan in Mannheim, Germany was complete with excitement as dozens of devotees and over one hundred people new to Swami filled the Darshan hall. Not only local Mannheim guests arrived, but more than two full buses of residents and community members came to support the event. A short note should be mentioned that this Darshan had some of its best livestreamed results yet! The Periscope application has had some of its largest use to date with over 350 viewers watching the livestreamed event! 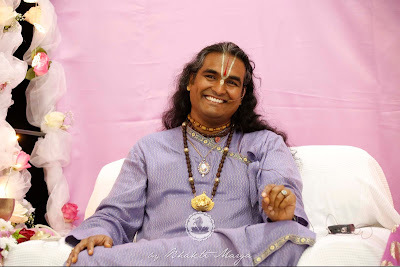 Follow @BhaktiMarga108 to get updates about the next Periscope livestream. Soon after arrival, devotees went en masse on a sankirtan voyage through the city. 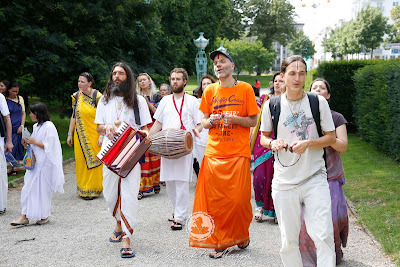 The kirtan-goers created a passion-filled wake that drew in people of all sorts to join the mobile concert. The party attracted interested citizens to follow back to the hall and receive Darshan from Sri Swami Vishwananda. 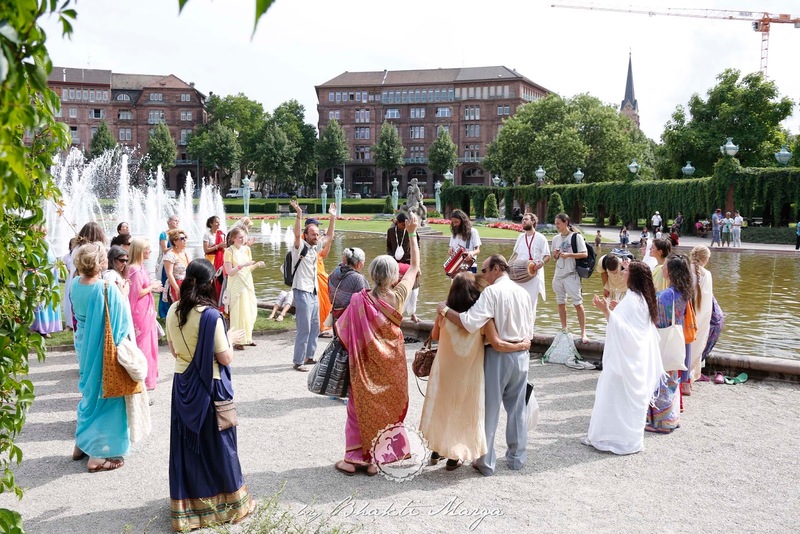 The devotee noted that he felt that “if we get one person to come to Swami, we are successful. 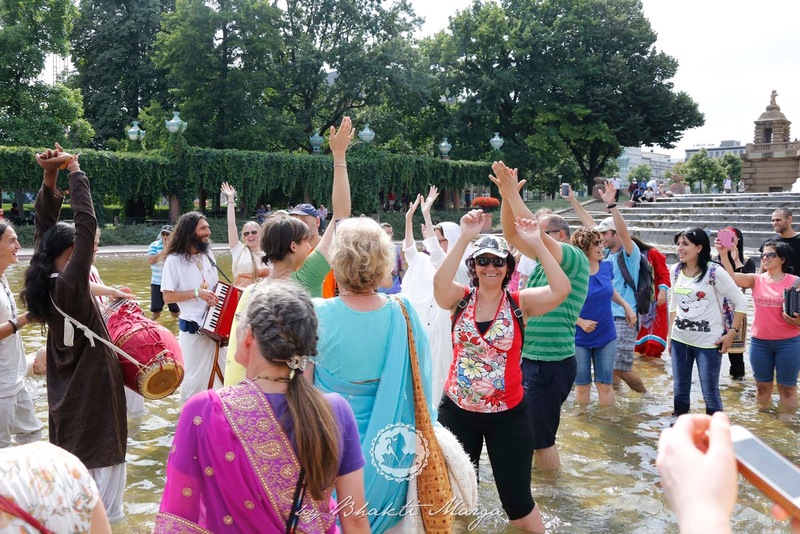 We gave away fliers for Darshan and it was a great experience when we got to the water fountain…so beautiful—Hari Nam, Gauranga, we chanted these repeatedly when we arrived. As the kirtan group had been dancing, soaking, and playing in the water fountain, he noted that the water got charged with the name of Gauranga. The curious people too, dipped in the fountain and tried singing. The group taught them to sing “Swami Vishwananda” and thus they were blessed through the water both the name of God and Guru. 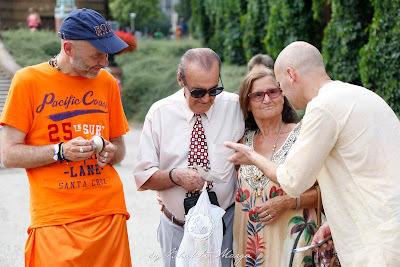 The devotee remembers around eight curious people that day who came off the street to join the experience of Darshan and had the opportunity to go straight to the front of the line to meet Sri Swami Vishwananda. 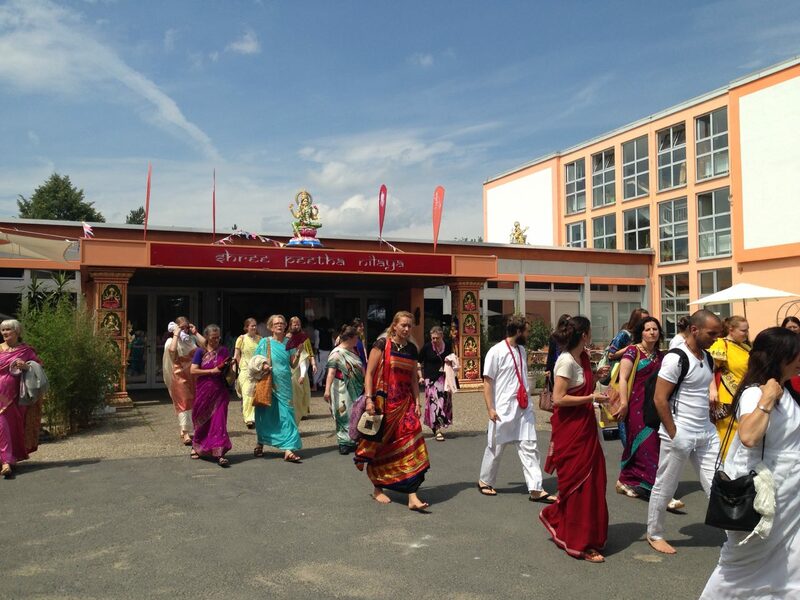 Due to the numbers, many devotees were required to wait outside the hall. Inspired by the previous successful kirtan, a second wave of music developed and another kirtan took off to the streets of Mannheim. 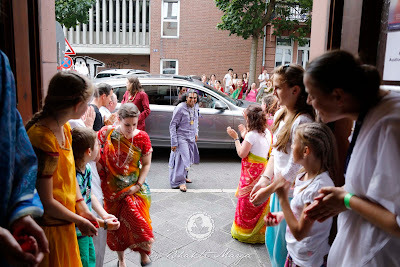 The enthusiastic singers and musicians attracted several more curious citizens to follow back to the hall to receive Darshan from Swamiji. 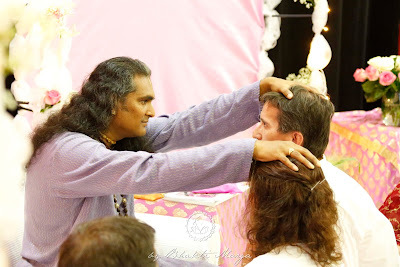 Many of these new to Darshan with Sri Swami Vishwananda were anxious for the next big event at Shree Peetha Nilaya, Gurupurnima. Swami Kuru had the opportunity to share OM Healing and the Mantra Project with a local yoga studio (Bala Shanti Yoga Zentrum). 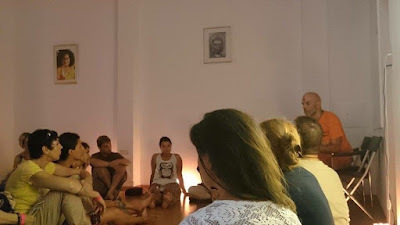 The people enjoyed it very much and had great questions to ask about Bhakti Marga, OM Healing, and the practice of the Mantra Project. 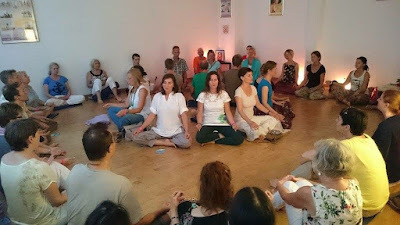 All in all, Darshan in Mannheim was a blast. Packed full of singing, music, and fun, Mannheim provided lots of special experiences to be remembered!